In 1870, the first Reform Congregation began meeting in the old Ruellmann Hall on East Commerce Street. Shortly thereafter, the Ladies Hebrew Benevolent Society of San Antonio was founded. 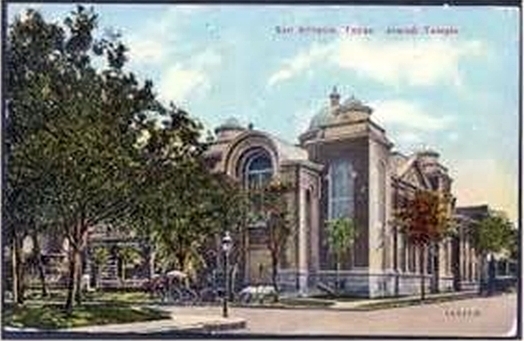 In 1874, Temple Beth-El of San Antonio was officially founded, making it the oldest synagogue in South Texas. The founders of Temple Beth-El included: Abraham Frank, M. Halff, Samuel Mayer, Louis Zork, Max Goldfrank, and Daniel and Anton Oppenheimer. The first building of Temple Beth-El was built at the corner of Jefferson and Travis. A second building was constructed in 1902 at the same location. 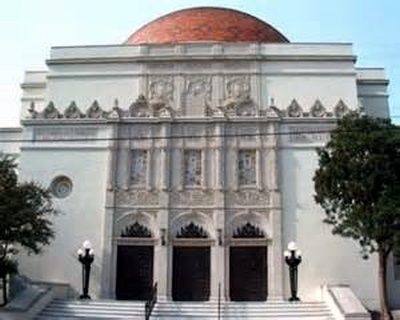 Temple Beth-El of San Antonio, it’s 3rd building. Around 1919, a new building was constructed at Belknap Place and West Ashby Streets. The basic building was completed in 1927. There have been many additions since. Unlike most early congregations, the rabbis of Temple Beth-El tended toward long-term affiliations with the synagogue and Jewish community. However, there were other rabbis who served for a short time since the synagogue’s beginning. From 1897- to 1920, the synagogue was served by Rabbi Samuel Marks. From 1923 to 1942, Rabbi Ephriam Frisch led the congregation. The congregation was next served by Rabbi David Jacobson until 1976. Rabbi Samuel Stahl served or 26 years, from 1976 to 2002, growing the congregation to 1,100 families, and still serves as Rabbi Emeritus. Rabbi Melanie Aron, the first female rabbi to work in Texas, was the rabbinical intern for Temple Beth-El in 1979. Rabbi Barry H.D. Block served the congregation from 1992 to 2013, 21 years. Currently, Temple Beth-El is one of the growing number of synagogues in North America with an all-female clergy team. Rabbi Maria Nathan became the Senior Rabbi in in 2014, working with Rabbi Marina Yergin and Cantor Julie Berlin. Samantha Silver is curator for this Temple Beth-El of San Antonio exhibit.